The ‘Giannis D’ was originally launched in January 1969 in Imabari, Japan, as the ‘Shoyo Maru’. In 1975 she was sold and renamed to the ‘Markos in 1975 and eventually in 1980 she became the ‘Giannis D’. She was equipped with a 4-stroke 6 cylinder Diesel engine capable of producing 3000 HP and a top speed of 12 knots. The ‘Giannis D’ did not have a specific task or route but sailed just as her cargo brought her. In April 1983, the ‘Giannis D’ was loaded with soft sawn wood in the port of Rijeka, Croatia. destined for the Saudi Arabian port of Jeddah and Hodeira on the coast of Yemen. The journey over the Mediterranean Sea was uneventful and straightforward. 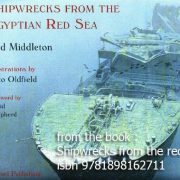 The captain left the easy navigation to his crew, knowing that as soon they approached the Suez Canal there would be little rest until the cleared the Straits of Gobal. At that time the Arab-Israeli war was going on and the checks were harsh and time consuming. Finally, they were allowed to enter the Egyptian waters and could continue their journey with the aid of a pilot. The Pilot left the ship just after it has left the Suez canal and into Suez Bay. The captain stayed on the bridge during this whole journey, convinced he was the only one who could accomplish this task. He was not the first captain still in command while he was way too tired to accomplish the task of navigating the Gulf of Suez, with its small islands, coral reefs, oncoming surface traffic and oil rigs. Sha’ab Abu Nuhas is positioned directly on the route form the Strait of Gobal to the open sea. On the 20 of April, 1983 the ‘Giannis D’ ran, full speed ahead, onto the reef. It is said that many safari boats form that time were built with the wood of the ‘Giannis D’. The ‘Giannis D’ is divided in three pieces. The bow, mostly still intact, a collapsed midship and the stern, mostly intact, with bridge housing and engine room. The deepest point is around 24 meters which makes a long dive possible. You have the nicest experience by entering the bridge by the doors on either side. When you enter the bridge, you see a square hole in the floor, the place where the stairway is located. Everywhere the wooden parts (and the stairs) are of course long gone. While descending to the next floor using the stairway you enter the deck a level lower. Once entered you will feel a strange sense that something is not correct. Your balance organ is telling you the ship is tilted but your eyes will tell you that it is leveled. Some divers will get dizzy! Another floor down we find another open space with tot he left a corridor to the stern. In the corridor we find on the right (port side) storage rooms and to the left (starboard side) a door to the engine room. No worries, everything is open and you can leave the ship on a dozen of places! Entering the engine room, you find directly down and in front the engine. On your left and a bit down a workshop with a lathe. You can follow this route and swim clockwise around the engine. On the other side of the engine(starboard) you find the pumps and generators. Also, you will find a bench with several huge spare valves, who demonstrate the actual size of the engine. All the (sneeze) covers are removed from the engine carter so you can see the huge crank shaft and piston rods. After spending some time in the engine room, we leave it again to the corridor and swim to the stern. At starboard we find the galley with the mess room behind it. But at this point here’s again a steel stairway down which leads to the stirring motor. Be aware of the electric wiring hanging loose from the ceiling. Turing right at the entrance of the stirring room we find the crew cabins, bath rooms etc. If we still have enough air and dive time left we leave the stern to find the bow. It is always impressive to see the damage on het bow where it had hit the reef. Swimming back to the stern we find enough resting points to make our safety stops. 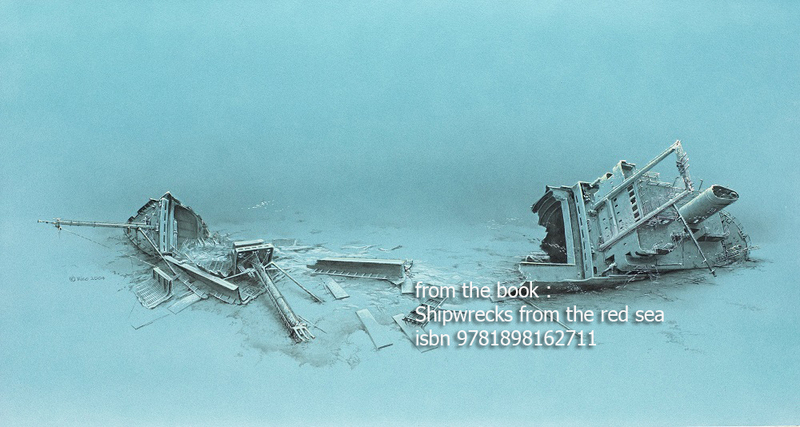 Our guides will be more than happy to guide you through this beautiful wreck. In the wreck you normally find large schools of glass fish, but also lemon fish and other species. Because it is rather dark you can also expect to see a large moray eel seeking shelter during the day. The opening in the reef to where the safari boats anchor, often dolphins are hunting. That is nearby the wreck so keep an eye on the blue as well, often you can see some dolphins swim by!